Easy to find, exceptionally well built, luxurious and, now, affordable; the BMW 5 Series is one of the best used buys in its class. The huge choice of engines means there's something for everyone and proven reliability along with the strength of the BMW badge on the bonnet make it a sensible long-term ownership prospect, too. 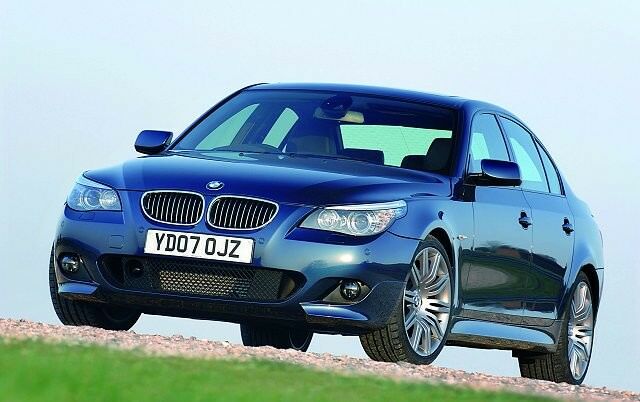 The latest BMW 5 Series hit showrooms late in 2010, which has served to drive down values of its excellent predecessor. Fine handling, superb build quality and luxuries aplenty are where the bulk of its appeal lies but it's also cheaper and easier to find than rivals like the Mercedes-Benz E-Class and the Jaguar XF. Diesels are popular because of their low running costs and potent power delivery, though basic petrol versions are where the bargains are. The BMW 5 Series has been a stalwart of the executive saloon segment and the new model continues to set the benchmark for rivals. It's also available as an estate (called the Touring), which sold in smaller numbers and hangs onto its value especially well. BMW is renowned for its excellent range of engines and the 5 Series is no exception - it has everything from sedate 2.0-litre petrol units through economical diesels to the frankly insane V10 unit found in the flagship M5. The majority of 5 Series on the used market are diesels because of their lower fuel and taxation costs, which in turn lend themselves to better resale values. The 520d variants are especially good at blending strong performance and low running costs. That's not to say that petrol variants aren't available, but, save for serious top-end models like the M5, standard petrol cars are less desirable and harder to sell on. They make for great used bargains, though. Mid-spec SE models are always worth a look because they include plentiful levels of equipment and they hold their value well. Business Edition models come loaded with kit while standard versions are to be avoided - they're affordable but they're of little interest to potential buyers when you come to sell on. A good 520d is hard to beat. It's swift by any standard yet uses just 6.0 litres/100km (5.1 if you get a later model), which isn't bad at all for a big executive saloon. Frugal diesel models are always the best place for your cash in the long run, too, and the 5 Series has proven itself on the reliability front over the years.